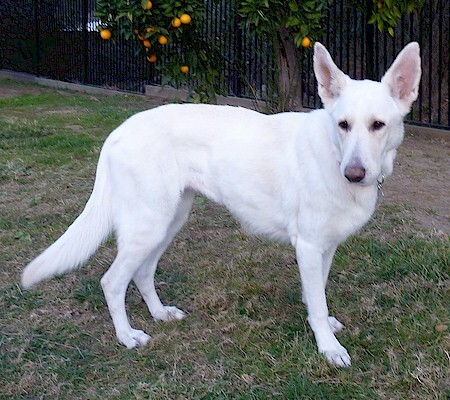 Lily White is a beautiful, 4-5 year old white German Shepherd. She is an owner surrender who could no longer care for her. 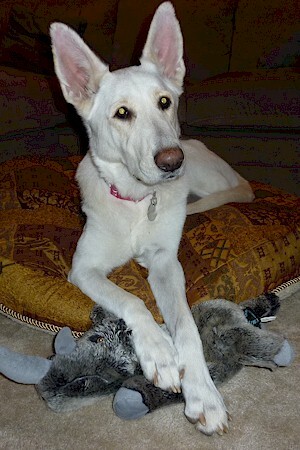 Lily White is housebroken, crate-trained, and knows basic commands such as Sit, Wait and Stay. She LOVES going for rides in the car and will nose her way into the garage at every opportunity. There, she will sit and wait by the car door to remind you that she is ready for her daily drive. She loves to fetch balls and will bring it back and drop it at your feet if there is a promise of the ball being thrown again for her. 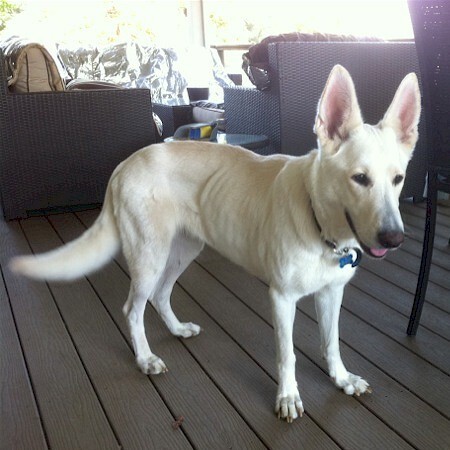 Lily walks well on a leash but occasionally is dog reactive to other dogs being walked. 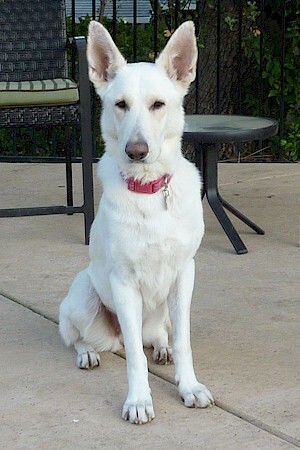 Lily came to us timid around strangers, but is becoming more confident and comfortable with new people and situations. Bringing her to public places and walking her around is helping her gain more confidence with other people, situations, and other dogs. Though she prefers to be with her people, Lily is learning how to be a member of a pack and play, mingle, and be tolerant with the other resident dogs. She has been curious but very respectful and calm around 2 older cats and may be able to live with them if carefully supervised. 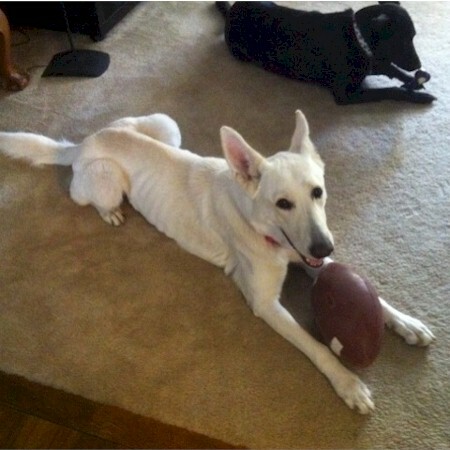 Lily is a Special Needs Dog who suffers from Exocrine Pancreatic Insufficiency (EPI) (Maldigestion Disorder) in dogs. EPI occurs when the pancreas does not produce the digestive enzymes necessary to obtain the nutrients needed from food. Once diagnosed, EPI is treated by adding prescription enzymes to each of several specific dietary meals per day. 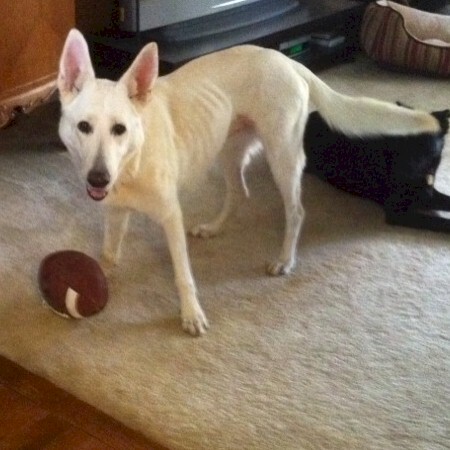 Donations to our Rainbow Fund help us save dogs like Lily. Is it worth it? Well, having fostered this loving beauty for the past few months, we resoundingly say YES! Now that she is correctly diagnosed, on medication and monitored daily, we are day-by-day discovering and uncovering more of her personality. 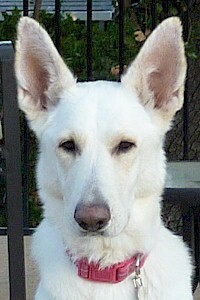 She is gently playful with her people, very calm, and demands her share of attention by bumping your arm with her nose. She is also quite solicitous, remaining at the side of a family member when they were down with the flu. 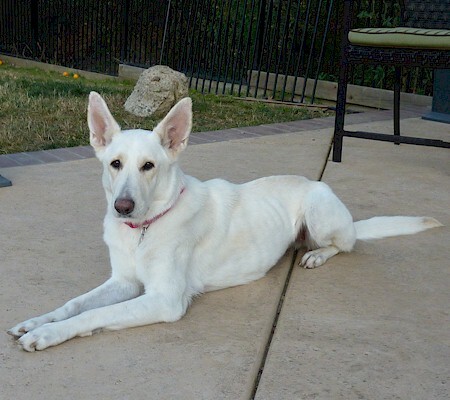 So if you are looking for a loyal loving companion, this is your girl. We will warn you though, wherever you go, people will stop to both ask about and comment on this strikingly beautiful girl. Below are some links to sites providing in-depth information on EPI. She is responding to the enzymes. We are also administering her weekly injections of B12 shots (the vet's office taught us how to do it) and have another month of shots to go). At first, her stools normalized after a few days, however, this week they reverted back to "cow pie" status for 2 days. I have been doing stool checks daily and we are tweaking/adjusting her diet accordingly (specifically what we mix her enzymes with). She struggled the first few days though her stool was not particularly firm. I believe she is just not used to what it feels like to have a normal bowel movement. She had a bad night Thursday and so I stayed with her all night (her stomach/intestinal tract could be heard upstairs - and it was clearly making her physically uncomfortable). She is beginning to perk up and I don't think it will be long until we see the true Lily White. She needs more time to put on weight (she is adding weight slowly despite a low fat high protein diet and feeding 3x's per day). Most importantly she is not losing any more weight. In retrospect, I am amazed that she made it through being spayed. She was so totally out of it for the two days following surgery. Out of concern, one of us was always with her. Those first two nights, she quietly crawled over to where I was sleeping and "spooned me". I think she needed the body heat but there were a few moments when it appeared she would not awaken. She whines quite a bit but under it all I think she is pretty tough with a strong will to live.